OurEvolution is a strong supporter of the electric vehicle revolution in Northern California! Our engineers can assist you in completing your electric vehicle charging station project by providing site civil and electrical design, procurement of electric vehicle supply equipment (EVSE), permitting, environmental compliance and construction services. Whether you’re installing a residential EVSE or need assistance with a commercial application, our team of highly qualified engineers and contractors has the experience to successfully complete your EV project. 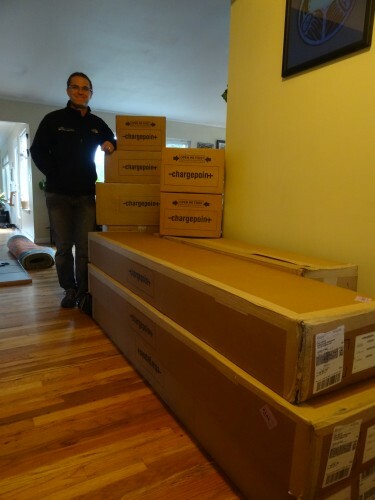 October 2014 – Andy Sorter of OurEvolution stands next to the next three electric vehicle charging stations in the Northern California Electric Vehicle Charging Network. These stations will be available for public use on the Blue Lake Rancheria and in the City of Blue Lake. 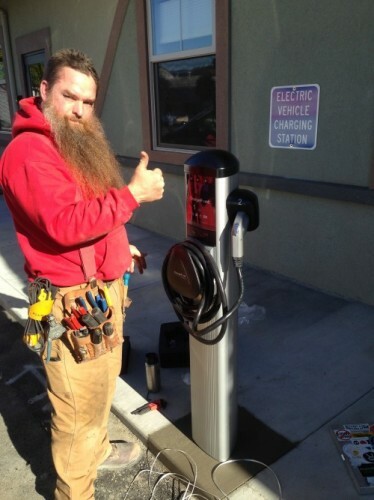 Look for more charging stations on the northcoast in the coming months! In addition to being a ChargePoint authorized dealer, OurEvolution can procure favorable pricing on Level II and III EVSE from Fuji Electric, Scheider, General Electric and more. Please contact us for more information and to learn about grants and other incentives your project may qualify for. February 2014 – Bohner from Alchemy Construction finishing up the ChargePoint Station in Eureka.